Image: Daily News. The Mustang after a low-speed tyre blow out! 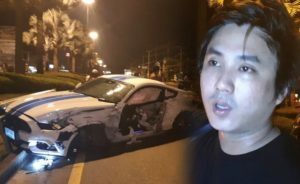 Well known Thai 1000cc motorcycle racer “Ohm Superbike” lost control of his Ford Mustang car after a tire blowout in Pattaya on Sunday. Kasit Ketjutharat, as he is also known, said that he was travelling at low speed and lost control hitting a parked bus before spinning several times and hitting a barrier. He said a right tire had blown out. Luckily he and a female passenger in the car were only slightly injured as airbags deployed. 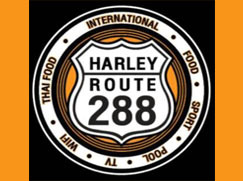 The accident happened outside the Four Regions Floating Market on Sukhumvit Road. Pictures showed the racer’s white and blue Ford Mustang with severe damage and damage to the side of a bus belonging to Plachiva Transport.